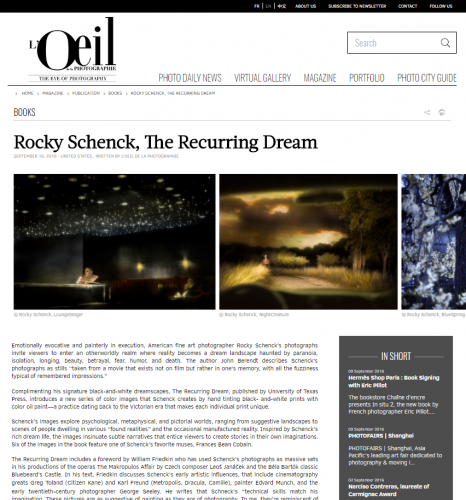 Complimenting his signature black-and-white dreamscapes, The Recurring Dream, published by University of Texas Press, introduces a new series of color images that Schenck creates by hand tinting black- and-white prints with color oil paint—a practice dating back to the Victorian era that makes each individual print unique. Schenck’s images explore psychological, metaphysical, and pictorial worlds, ranging from suggestive landscapes to scenes of people dwelling in various “found realities” and the occasional manufactured reality. Inspired by Schenck’s rich dream life, the images insinuate subtle narratives that entice viewers to create stories in their own imaginations. Six of the images in the book feature one of Schenck’s favorite muses, Frances Bean Cobain.